As a savvy Club member, you can recognize the value of buying Cheerios® cereal at your local Costco, Sam’s Club or BJ’s. While buying Cheerios at Club is already easy and affordable, new 2 box Cheerios packaging format makes Cheerios an even better purchase! You can cheer on the value by purchasing the new 2 box Cheerios packages in Club! I love the new packaging. I have always bought the big boxes from my local Club store and had issues with product going stale because the bags were not easily closed inside of the box. Another issue was once you got one of the twin bags out then it was hard to make it go back in. The new twin pack really is a great idea. 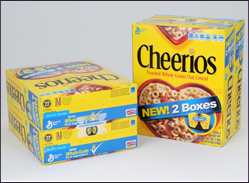 New 2 box Cheerios contains two individual boxes, making them easier to store and easier to pour! You don’t have to take my word for it, check out all the benefits of new 2 box Cheerios packaging and feel free to share!